For many of us, there's nothing more important to do online than check, read, and write emails. 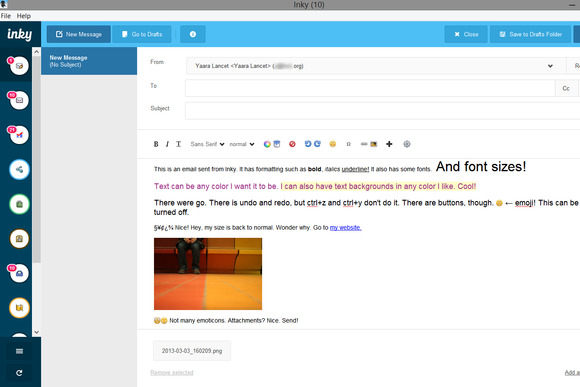 Inky is an email desktop client that brings all your email accounts together under one roof. It offers most of the features you're used to, and something different as well. This is just one of the possible ways to read emails with Inky. You can control almost every element. Like Postbox and Mailbird, Inky tries to find a new way to play the old email game, and with interesting results. The program is not even officially launched for PC yet, but it's out there and available to use on your desktop, with mobile and tablet versions in the works. The Mac version of Inky received a favorable review from Macworld. To get started with Inky, you'll need to connect your email accounts. If you're using a big provider such as Gmail, Hotmail (Outlook.com), Yahoo, etc., Inky will recognize and fill in the necessary settings for you. If you're using a different email provider or Google Apps on your own domain, you will have to set things up manually. This process wasn't as smooth as I expected, with several failed attempts to get my Google Apps account recognized, but after leaving everything be for several hours, I came back to Inky and managed to connect my accounts instantly. Working with Inky is both different from and similar to everything you're used to. Inky takes elements from common email clients and adds its own unique touches, creating a sum that's greater than its parts. You can add as many accounts as you want to Inky, and decide which ones you want to include in your Unified Inbox. Smart Views such as Social, Daily Deals, and Subscriptions can also be included, and will attempt to automatically recognize emails from your social networks, daily deals providers, etc. You don't have to use the Unified Inbox, though. Your workflow is entirely up to you, and checking each account separately is possible, and even easy. One of Inky's most prominent features is its interface flexibility. Unlike Gmail, where you have almost no control over your email interface, Inky lets you decide what your client is going to look like. No matter what interface you choose, all other options remain readily accessible through dropdown menus on top. With these you can also sort your emails to display only unread emails, only flagged messages, only emails with attachments, only emails you haven't replied to, and so on. It's also easy to sort emails by day, time, subject, author, size, and even relevance. The composer comes with many useful features, and it automatically saves drafts. Aside from attempting to clean up your inbox by filtering the likes of daily deals emails to its Smart Views mailboxes, Inky will also try to figure out how relevant each email is to you. A blue drop next to each email represents this message's relevance level--dark blue for relevant, light blue for not so relevant. Naturally, you can tell Inky when it's wrong, slowly teaching it which emails are really relevant to you. Another way to catch important emails is by enabling the Personal Smart View, which catches all emails from known contacts and aggregates them into one mailbox. Unlike many Web interfaces, Inky presents email threads with the newest email on top, and each thread is expandable right in the mailbox. This makes it super easy to read long threads, as long as you don't mind reading them from newest to oldest (it's possible to go the other way around, but it's no longer that easy). Within each message, you'll find all the usual options such as reply, forward, archive, and move to a different folder, but also other options such as copy message, save as, forward as attachment, and more. With one click, you can mark a message as unread or flag it, and also mark its relevance. 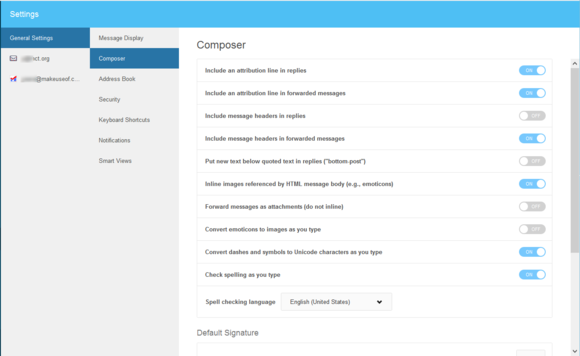 The editor itself provides all the features you've come to expect from an email client, including formatting, emoticons, links, images, spell checking, and attachments. RTL support is not optimal. Many options are available through keyboard shortcuts as well, and there are several shortcut sets to choose from. Make sure you review these carefully, though; it's possible to set Inky to use Gmail's shortcuts, but these are not completely identical to the ones on Gmail. Make sure you know which shortcut does what. The current Inky experience is not bug-free, unfortunately. In fact, I encountered several issues which are hard to ignore: my name did not appear on my outgoing emails despite the right field being set to show it; unread counts were inaccurate most of the time; and emails disappeared while I was reading them when viewing only unread emails. You can change almost every aspect of Inky via the Settings. On the flip side, every time a feature didn't work quite the way I wanted, I checked the settings and found an easy way to tweak it to my liking. In addition, the program includes an easy way to report a problem or provide feedback, and when I did this, I got an almost instant helpful reply, before the person who fielded my query even realized I was a journalist trying Inky for this review. Inky is a long way from being perfect. Not even officially launched yet, the lack of mobile client and the presence of some persistent bugs could make a full transition hard if you rely heavily on email. It's also missing some crucial features such customizable filters and undo send. I'm keeping an eye on Inky. 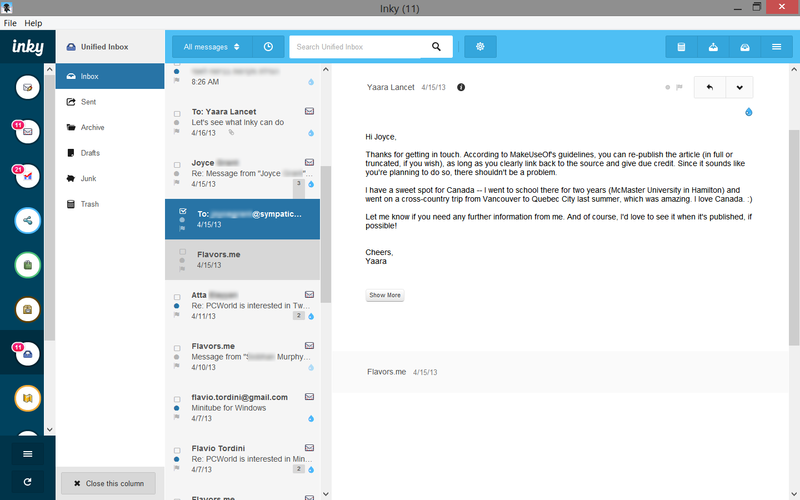 In a world where most email clients offer the same old features, Inky shows immense promise, and has real potential in revolutionizing the way you use email. It's only a matter of waiting until it's truly ready. As it is now, Inky is worth a try. If it comes through on its promise, it will be worth a switch.